The voice is one of the most powerful avenues of human expression and as such, provides an effective tool for communication and influence. Every voice is unique and when recorded and analysed with computerised software, becomes a map of their physical and/or emotional state. "Research has shown that when we are deprived of certain light frequencies we can become sick (SAD). One of the most fascinating scientific facts to emerge recently is that sound behaves in a similar fashion to light. In other words, sound and light act like vitamins and minerals in our body. Most people are deficient in certain tones and this is traced when the human voice is recorded and monitored. We need a certain balance of sound frequencies, which may vary from one individual to another, in order to maintain our bodies in a healthy state". Following on from this you may ask the question… How do we know what we need? Well voice analysis is an ideal program to identify the high and low areas within your body and replace the low areas with the correct sounds to bring about balance. The graph shows the vocal print of an individual that shows an out-of-balance state. This is highlighted, as the light green/yellow areas of the voice are extremely high in energy. Who can benefit from a Voice Analysis/Sound session? Clients with physical and emotional health problems. Most people are deficient in certain tones and this is traced when the human voice is recorded and monitored. We need a certain balance of sound frequencies, which may vary from one individual to another, in order to maintain our bodies in a healthy state. The frequencies that are taken from the voice fall into the range of the musical scale, hence a person may be low in the area of energy related to the note of "C" and high in the note of "F". This beckons questions like "why do we like specific music, people, colours etc (all due to the way in which we absorb frequencies for balance) In the UK this is a relatively new concept and modality, however it is extremely powerful as an initial energetic diagnostic tool. A typical session would involve an initial Voice Analysis to determine the client's energy levels and in what areas you may be over or under utilising your energy. 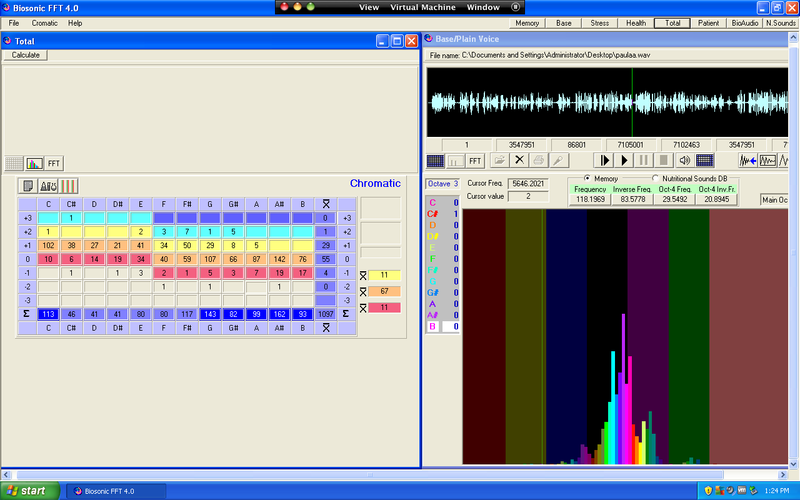 This is PC based and involves answering a few questions to enable the computer to assess the frequency range covered by the voice. This can be done either locally or over distance by recording your voice and sending us either a CD or Mp3 recording, we then analyse the frequencies within your vocal print and create a frequency solution to help you bring back balance within your system.